The latest PC patch for PlayerUnknown’s Battlegrounds is now available on test severs. PUBG’s update 13 is not a major one, but it still manages to have a few interesting changes. Under Customisation, there’s now a new Gear option, which lets you choose a parachute skin. The first of these, called the Bengal Tiger skin, will be available for purchase for $5, replacing the Target Practice pan skin. Speaking of skins, there’s a new cosmetic crate to look forward to. 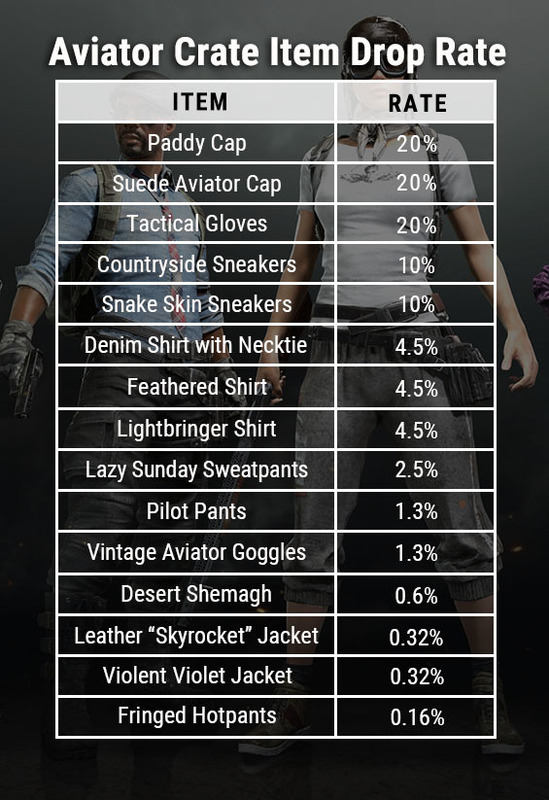 It’s called the Aviator crate, and it’ll require the Aviator key to unlock. Though this update doesn’t feature any performance improvements, the developer noted that it’s aware of growing concerns about deteriorating game performance and will address them in the future. PUBG Corp. also promised more balance updates soon. The next of which will bring some tweaks to the M16A4. Future updates will also change the weapon drop rates, though the developer did not share any specific details. All of this is available now on test servers, and will hit live servers later today. Expect a four-hour maintenance today at 7pm PDT, 10pm EDT which is 3am BSTtomorrow. Customisation > Gear tab has been added. Go here to equip parachute skins. 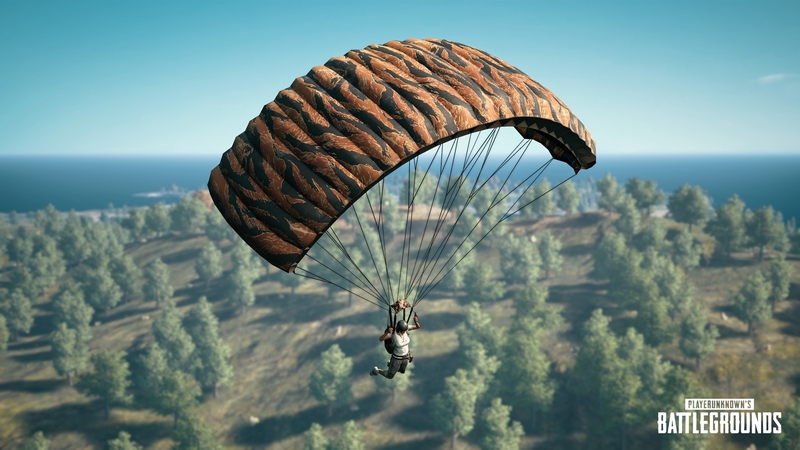 The “Bengal Tiger” parachute skin can be purchased separately as an individual item for $4.99(price will vary slightly in some regions, based on global exchange rates). It can be purchased only once per account. The Target Practice Pan skin will no longer be available after the planned 5/17 update! Sony’s E3 2018 PlayStation showcase could have PlayerUnknown’s Battlegrounds (PUBG), Bloodborne 2, a new BioShock game, and a new SOCOM title too. According to a leak originating from 4chan (viaGamerant) we could see a host of unannounced games joining those expected to get stage time at the PlayStation E3 2018 showcase. While some of the games on this leaked list are known entities such as Final Fantasy VII Remake, Kingdom Hearts 3, The Last of Us: Part II, Spider-Man, and Ghosts of Tsushima to name a few, others such as BioShock Resurgence in PS VR that too seem like odd choices, making us caution against taking this leak at face value. Interestingly, this is the second time a possible Devil May Cry 5 reveal has been speculated. Earlier it was discovered that Capcom had obtained a domain for the game and had its name servers updated recently. And while this may lend some truth to the rumours, the anonymous nature of this leak makes it tough to ascertain. It doesn’t help matters that the list contains that are guaranteed to show up at the even anyway such as The Last of Us: Part II. This leak follows those related to Microsoft and Nintendo E3 2018 reveals. Before each E3 comes a host of rumour and speculation on what to expect. While some of it ends up being true, such as God of War’s Norse setting made public before the official reveal, others such as a new Halo game have sadly been false. As we’ve said earlier, keep your expectations in check. Yesterday, developer PUBG Corp announced that PlayerUnknown’s Battlegrounds’ second map, the desert-themed Miramar, would be leaving testing and launching on Xbox One next week, on Thursday May 24th. Prior to full release, however, Miramar is undergoing one final round of public testing. Should you wish to get involved, test servers are now open and will remain so until Miramar shifts to the live servers on May 24th. What’s more, there’ll be no downtime to speak of, given that PUBG’s public test servers will continue to host Miramar while live server maintenance is underway. According to PUBG Corp, Battlegrounds’ latest round of public testing on Xbox One supports play for Solos, Duos, and Squads, and isn’t soley restricted to Miramar; it will also include the latest optimisations, tweaks, and bug fixes for original map Erangel. On the optimisation front, shadows have been finessed to reduce crashes in certain situations, while tweaks have been made to allow buildings and their interiors to load simultaneously, reducing the overall rendering time. The developer notes, however, that Miramar will require additional work in order to bring it to the same level of optimisation as Erangel. Elsewhere, vehicle and weapon spawns have been increased on Miramar, and numerous adjustments have been made to Battlegrounds’ settings options. A full list of changes and additions can be found in PUBG’s latest Xbox One patch notes. The developer reminds eager players that Battlegrounds’ public test servers can go down for maintenance at any time. One of the best-selling games in the world right now is PUBG. Gamers all over the world battled for the top 20 position for a chance to showcase their skill in the first world tournament of this game. Though an individual can use hacks and cheats like pubg esp while playing at home, in the professional world tournament, this is not allowed. ESP hack is simple. Its primary function is to show a players’ name and location on the map irrespective of how far or near opponents are present. This hack makes it impossible for others to win a match. Through this, you get all the fun gaming provides to win a match without much hassle. However, since tournaments do not permit the use of hacks and cheats, certain strategies one needs to follow in order to win a match. Check expert advice which is below! When playing solo, one doesn’t need to worry about anyone other than himself/herself. However, when playing in a squad, each member of the group has a crucial part to play. First of all, synchronization and coordination is a must as all four people should try to be safe until the end of the game. The number of team members survives, the better is a group’s chance to shoot down other teams with fewer players. Coming to play style, the entire team needs to agree to the style of playing which suits them best. Too much offensive is not the way to go unless a player can use a cheat such as player unknown battlegrounds esp. Similarly, playing too defensive will also get the team in severe troubles or lose a match. The correct procedure to progress is, wait and strike at the correct moment. Engaging only when needed, is something all pro gamers concur. It is vital that every team member has remarkable weapons. Without it, eliminating others becomes tough especially when going up against professionals. Choose the weapons according to the strategy set along with activating pubg esp unless playing in a tournament where pubg hacks aren’t allowed. Vests and helmets are a must as these offer an individual the chance of not getting killed by one shot. Thus, help one to escape from the location and healing one’s self with medkits. Different level helmets and vests are available for better protection. Being in a third person shootout game, a player might think, having guns and ammo are the only essential things. However, that is not the case at all. Guns are essential for eliminating opponents. However, without med-kits, bandages, painkillers, and energy drinks it is hard achieving the great victory. So, it is critical that gamers stock these up in their bag and use them when no enemy is around (that you can check with player unknown battlegrounds esp hack). Playing by following these rules is the main difference between a newcomer and pro. Using these tips and pubg esp, you can become a real competitor to players all around the world. read more about PUBG hacks. So, start playing today while keeping these rules in mind!